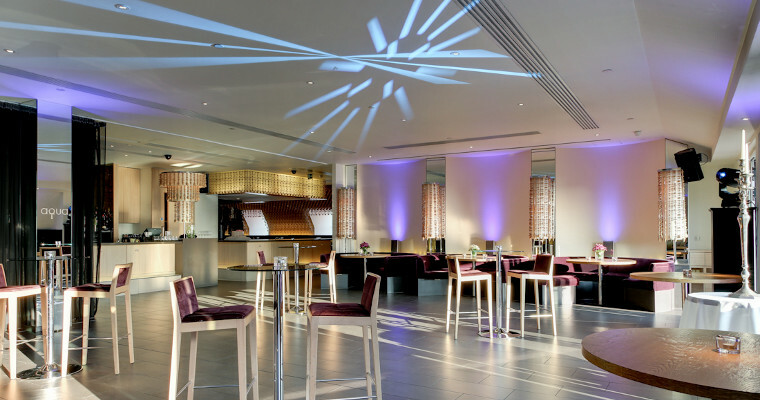 While to many we’re best known for our restaurants, bar and terraces, savvy event organisers also know that aqua london offers some of the capital’s most spectacular, and flexible, events spaces. In our elegant Spanish restaurant aqua nueva, choose from private dining for up to 16 guests to a lunch, dinner or reception in the main dining room, which can accommodate up to 80 guests seated or 150 guests standing, with use of a stunning private terrace. Alternatively, aqua nueva can be hired exclusively for up to 150 guests seated or 400 standing. In our sleek Japanese restaurant aqua kyoto, you can hire the restaurant for up to 110 guests seated or 250 standing, or, when combined with the dramatic adjoining aqua spirit bar, the capacity increases to 200 seated and 400 standing. For larger parties the entire venue can be hired for up to 170 guests seated or 800 guests standing, making us one of the largest venues anywhere in central London. Recently we’ve held 3 mini showcases for local businesses and events clients; we like to show how much we value everyone and it’s always great to welcome people who haven’t been before! For each showcase we had beautiful floral displays from our preferred supplier Igloo, entertainment including a magician and photo-booths, mouth-watering canapés from our events menus and cocktails from the aqua nueva bar team. We are still welcoming enquiries for pre-Christmas events; for more information or to book, please contact Holly or Thalia in our Events team on 020 7478 0542 or [email protected] And if you book an exclusive event at aqua London, to take place before the end of 2014, you can enjoy a complimentary dining experience in either aqua shard or Hutong in 2015 for four people! Exclusive events classified as being a minimum spend of £10k or more (including VAT, excluding a 15% service charge on food and beverage). The event must take place before the end of 2014. The dinner prize is for a maximum of 4 people and includes a glass of champagne on arrival, the guests’ choice from the A La Carte menu and a bottle of wine chosen by the sommelier. The dinner can be taken from January 2015 and is subject to availability.